Please accept our apology for any recent delays or inaccuracies with our rent subsidy payments. These are the result of a challenging software conversion that all regional administering agencies are implementing. We are working hard to make manual corrections as necessary and are doing more frequent check runs to get payments out as promptly as possible. We appreciate your patience over the coming weeks as we work through these issues. Dr. Sandel persuasively delivered this message to Housing Solutions’ Annual Meeting on November 13 at the Shaw’s Center in Brockton. The 115 attendees – including bankers, area residents, social service providers and public officials – came away better informed and convinced about the critical link between the health of families and the housing services and units that Housing Solutions provides. “Poor housing quality,” Dr. Sandel added, “is also the strongest predictor of emotional and behavioral problems in low-income children.” She further reported that research indicates that unstable housing, as indicated by a family moving 3 or more times or falling behind on their rent in the previous year, has nearly the same negative health impact on children and parents as does homelessness. Dr. Sandel’s message underscored a theme that was repeated throughout the Annual Meeting – including in the presentation of Housing Solutions strategic plan and with the Community Service Awards: Stable housing is the foundation for a healthy and prosperous family, community and region. In addition, long-time employees Mary Bulu and Norma Martin were recognized with Staff Lifetime Achievement Awards for their 30-plus years of service to the organization and its customers. The organization also presented community service awards to Mark Bilton of the Department of Mental Health for his work over the last 10 years securing stable housing for DMH clients and Peter Forman and the South Shore Chamber of Commerce for their leadership in advocating for increased housing opportunities in the region. Daniel Dennis & Company LLP Mass. Housing Investment Corp.
HallKeen Management The Narrow Gate Architecture Ltd.
ICON Architecture Tracker Systems, Inc.
Matera Vopat Matera & Johnson P.C. 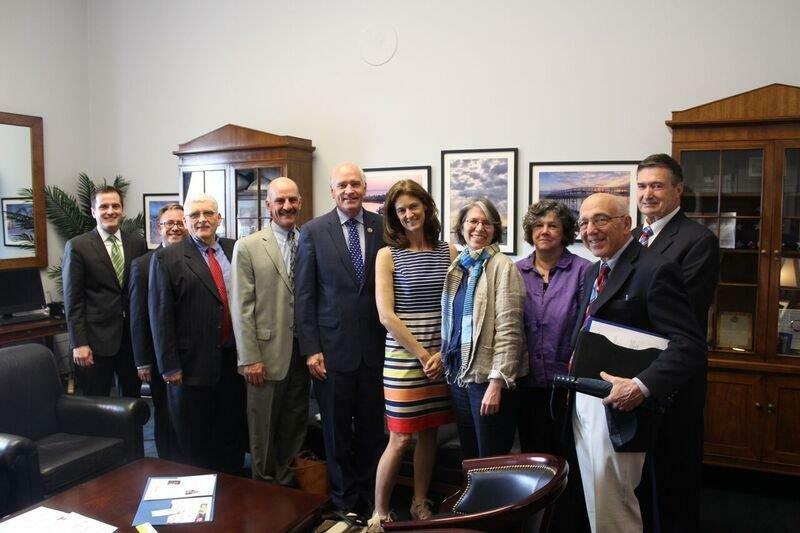 Housing Solutions and Other Regional Housing Agencies Take their Message to D.C. The group arrived in Washington on May 23 just as President Trump’s budget was made public, with its proposed 5% cuts to HUD rental assistance programs that would translate into the elimination of rental assistance to 250,000 households. The group met with the offices of all the Massachusetts house representatives and senators, none of whom needed any persuading to stand up for the rental assistance and other HUD programs that Trump proposed slashing. Even so, it was an important opportunity to articulate the impact the rental assistance programs have on low-income families, as well as on the local communities and economies where tenants and landlords live. The complex budget process continues to play out. With Trump’s severe budget proposal deemed to be “dead on arrival,” the House THUD Appropriation Committee recently approved more modest cuts to the Housing Choice Voucher (Section 8) Program. While our regional housing agencies alone can’t insulate critical HUD programs from cuts, it is important that we impress upon our elected officials the impact that these programs have on the lives of so many struggling families and individuals. We and our Massachusetts delegation will continue to hammer that point home.